You can always use more space! That seems to be our motto when we travel. Whether it’s to make sure we have all those essentials (layers, layers, layers!) or whether we want to have enough room to bring home those coveted souvenirs. Our friends at Well Traveled Gear have a set of Compression Packing Cubes that will help us ensure that there’s enough space in our bag for everything we need. Here’s the stats on the 3 piece set: arctic large (15.7” x 11.2”), desert medium (13.8” x 9.8”), and sunrise small (11.8” x 8.5”). The bags can be unzipped completely to make packing easy, and the double zipper compression system takes the bag from about 3.75 inches down to 1.8 inches. Wow, talk about space saving! 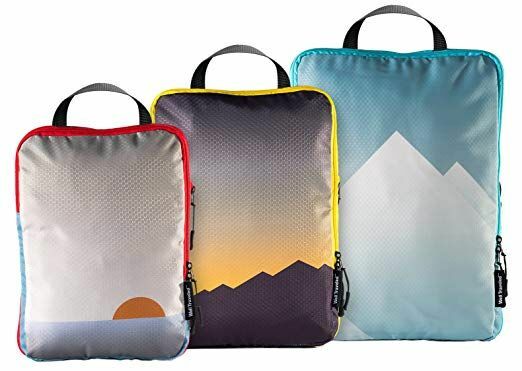 Designed out of a lightweight, water-resistant, rip-stop material with a convenient carry handle, all three are made really well with sturdy seams and zippers that can stand up to the strain of compressing contents. They are machine washable too which is super handy when you’re bringing back dirty clothes. The Well Traveled Gear Compression Packing Cubes will be this TrailblazerGirl’s go-to traveling companion!